MS PATTEN (Northern Metropolitan) (15:01:09): My constituency question is for the Minister for Health. My constituent phoned yesterday, having had her dental appointment cancelled unexpectedly at Merri Health in Coburg. 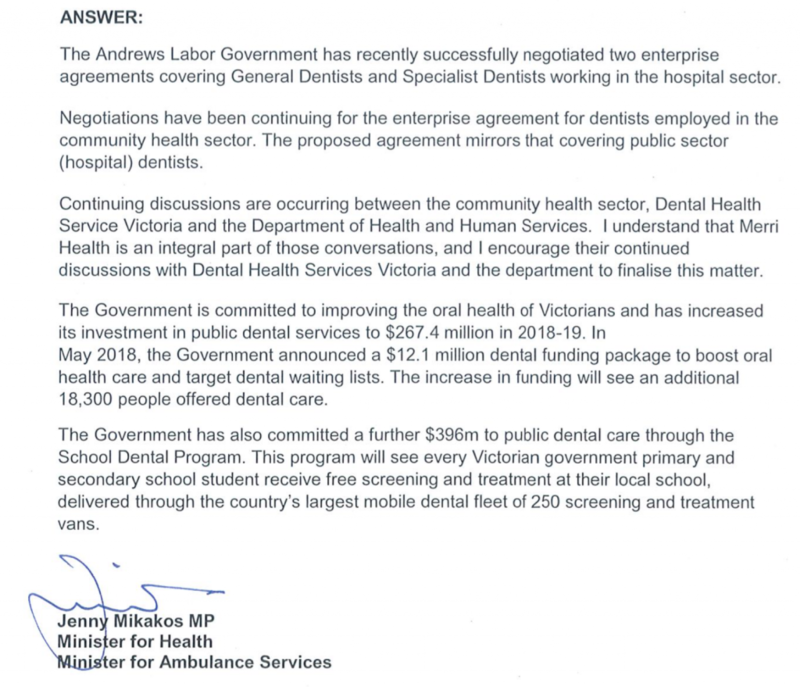 I contacted Merri Health to inquire and now understand that the cancelled appointment is a consequence of a new enterprise agreement for community health sector dentists, supported by the government, which mirrors the enterprise agreement for dentists working in hospitals. Merri Health says the proposed changes will cost them $300 000. Without supplementary funding, this means they have no option but to cut services in order to keep operating. They explained to me that five months ago the Department of Health and Human Services suggested that some supplementary funding may be available to help agencies fund the new agreement, however nothing has been forthcoming. Having relayed this explanation to my constituent, she asks: will the minister fund this gap so that there is no loss of dental services in the already severely stretched community health sector in Northern Metropolitan Region?